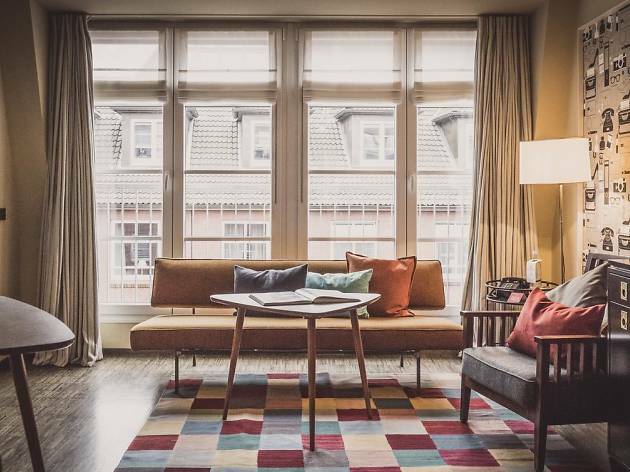 Neatly located for the Altstadt, Inner Alster lake and Hamburg’s central station, Henri channels top modern traveler standards with retro homely flair. 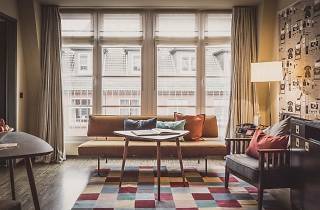 Its rooms, ranging in size from a medium studio to large suite, offer a certain bachelor-pad aesthetic, textured by cozy blankets, colorful accents and lots of light through the building’s generous old townhouse windows. Henri’s ethos is very much a ‘home away from home’ with the spacious downstairs lobby serving as a common lounge, library and breakfast area, and the communal fridge stocked with drinks, soups and snacks which guests can help themselves to around the clock. There’s a small sauna and gym on the top floor.